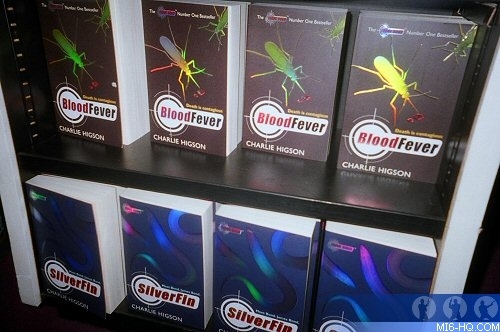 Charlie Higson’s first two Young Bond adventures, SilverFin and Blood Fever, have together sold 350,000 copies since March 2005 and have spent a combined 20 weeks in the top ten children’s bestsellers. The third novel in the series was published by Puffin today (4th January 2007). 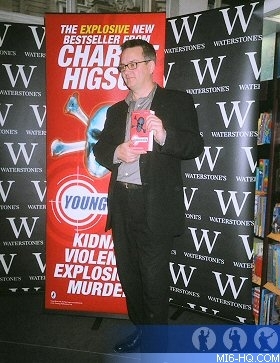 The title was unveiled by author Charlie Higson at Waterstones in Piccadilly, London at the official book launch yesterday. After being introduced by compere Robert Pound and giving a brief speech, Higson - who was also kept in the dark about the title - ripped off protective foil from a copy at 11am revealing "Double Or Die" to a crowd of cheering fans and press. The title Double or Die was voted for by the British public in an unprecedented nationwide readers’ ballot via the Young Bond website. Thousands of fans have become part of James Bond history by voting for their favourite of three given titles, devised by Charlie Higson: Double or Die, N.E.M.E.S.I.S. or The Deadlock Cipher. 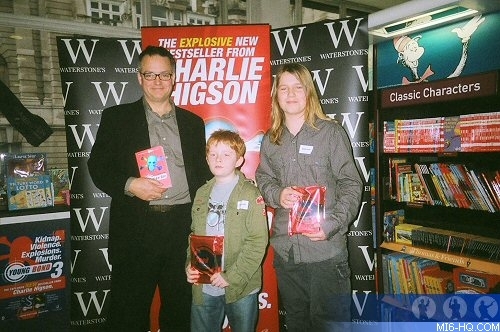 Higson then presented a copy each to Billy Jones, Stanley McCarthy and Teddy Mackereth who all appear in the novel. 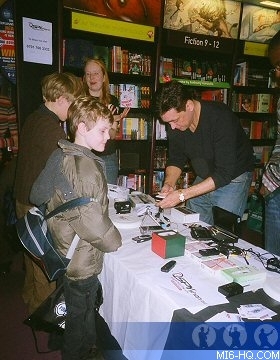 After the press photo call was completed, a signing session started where Higson autographed fresh copies of the book for fans. 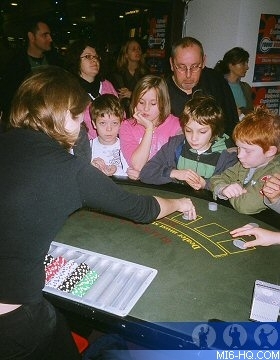 Meanwhile, children at the event could play at a Bond themed Blackjack table, Spy Shop table and Brainteaser puzzles table. The event wrapped at 1pm and fans headed home to devour the new adventure. Double or Die is set in the dangerous underworld of 1930s London; a world of illegal gambling dens and Cambridge spies; of East End gangs and tough Irish dockers. The novel opens in Highgate Cemetery, where an Eton professor is kidnapped at gunpoint. A suspicious letter crammed with cryptic clues arrives at Eton, where James Bond and his crossword enthusiast friends set to work on it. To decipher the deadly mystery, James must take a series of dangerous gambles, leading him on a perilous journey across London during which he escapes death again and again. Once the code is cracked, James has just 48 hours to save the professor from the dark forces that threaten to destroy them both. And they both know that it is not only their own futures that are at stake. In Double or Die, Charlie Higson serves up another cracking adventure for young readers about the boy who is to become the world's best known secret agent.